Follow the A1-E17 motorway between Lille and Lens, exit at Junction 19 and head towards Seclin. Follow signs for the town centre. At the first set of traffic lights turn left, signposted Bergault. Follow this road for about 1.5 kilometres to a second set of traffic lights and turn left (there is a small sign for the cemetery but it is easy to miss this) and then an immediate right. The cemetery is at the far end of the lane. The war graves will be found immediately inside the cemetery gates which have a CWGC sign on them. 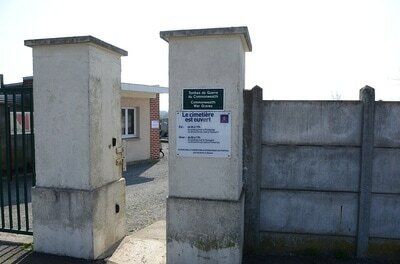 Seclin is 11 kilometres south of Lille, and is on the main Lille-Lens-Arras road (N.25). This cemetery, one of two communal cemeteries in Seclin, is in the eastern part of the town, on a minor road leading to the neighbouring hamlet of Ennetieres. 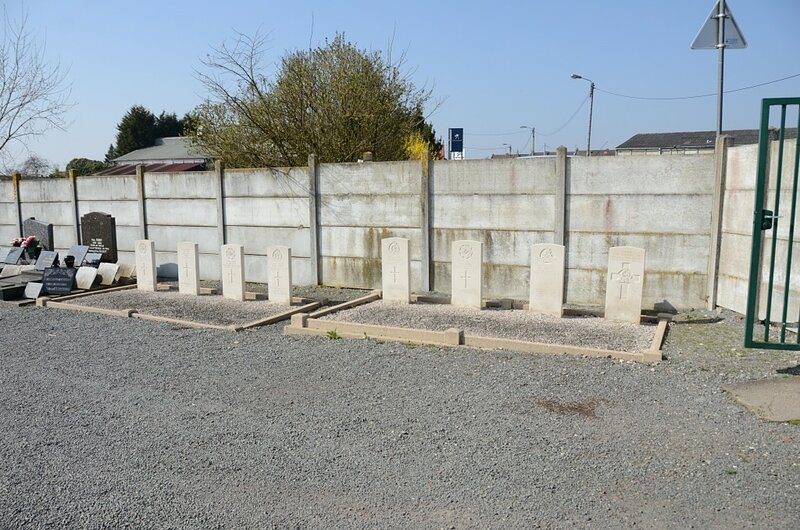 In the northern part, close to the western boundary wall, are the graves of eight soldiers from the United Kingdom, one of whom is not identified. 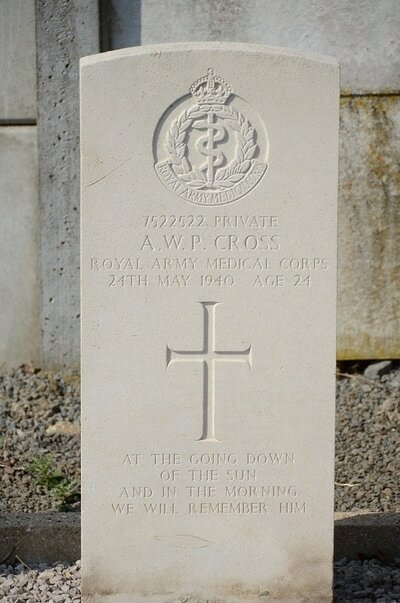 25th May 1940, aged 31. T/1062298 Driver Walter Dobson, Royal Army Medical Corps, died 1st June 1940. 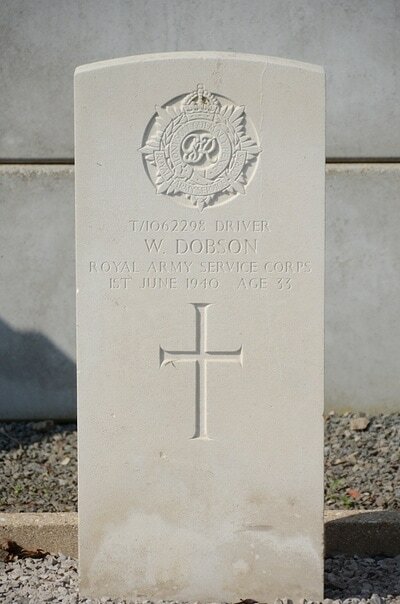 Son of Walter and Rhoda Dobson; husband of Gertrude May Dobson, of Leeds, Yorkshire. 7346271 Private Leonard William Freeman, 150 Field Ambulance, Royal Army Medical Corps, died 24th May 1940, aged 30. 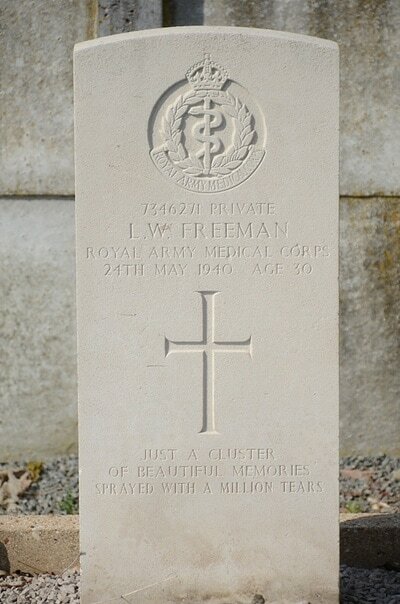 Son of Richard William and Ada Louisa Freeman, of Hull; husband of Alice Freeman. 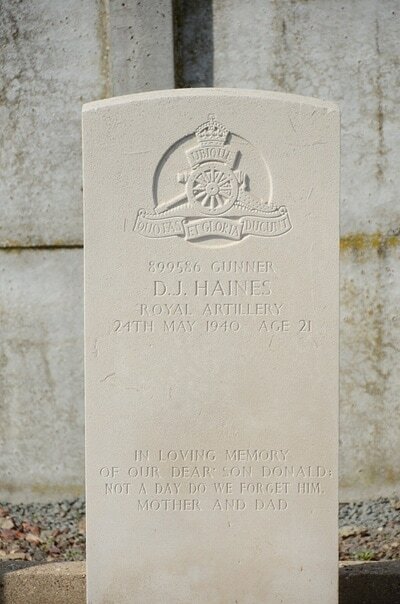 899586 Gunner Donald James Haines, 92 Field Regiment, Royal Artillery, died 24th May 1940, aged 21. 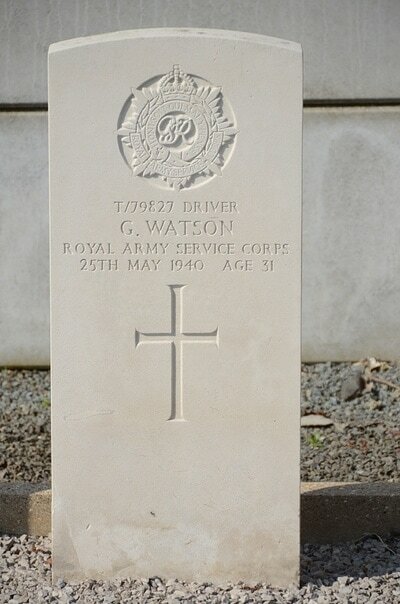 Son of Walter James Haines and Ada Lilian Haines, of Abbey Wood, Kent. 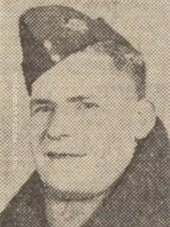 52841 Captain Richard Whitaker Porritt, 1st/5th Bn. Lancashire Fusiliers, died 26th May 1940, aged 29. Son of Lt.-Col. Austin Townsend Porritt, T.D., D.L., J.P., and of Annie Louise Porritt (nee Law-Schofield), of Grange-over-Sands, Lancashire. Honours Graduate, Cambridge University. 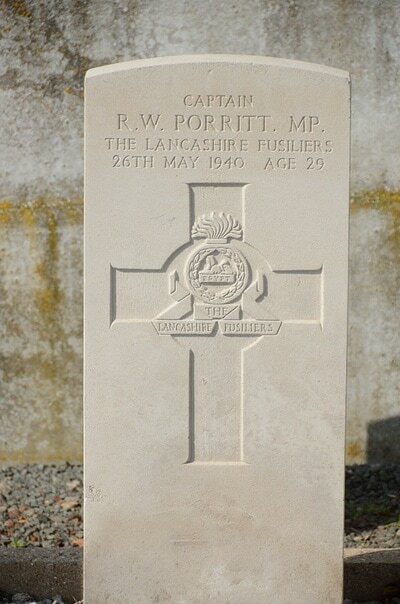 Member of Parliament for the Heywood and Radcliffe Division of Lancaster, 1935-1940. T/92277 Driver Kenneth Gordon Ridge, Royal Army Service Corps, died 24th May 1940, aged 25. 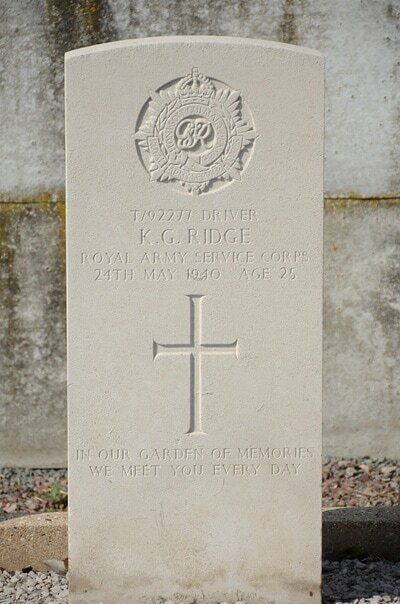 Son of Arnold and Clara Ridge, of Sheffield.